A hand-coloured postcard upper body portrait of a Shilluk man wearing neck ornaments, body cloth tied at the shoulder and sculpted hair, blowing a side-blown instrument made from a large curving antelope horn with gourd end piece. Notes on postcard - "C.-487 Copyright. G.N. Morhig Khartoum. 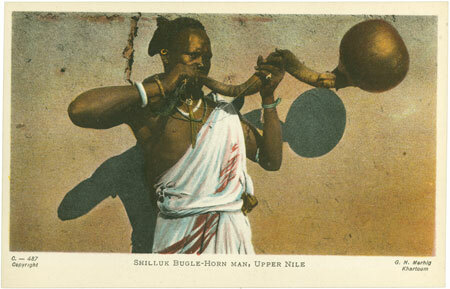 Shilluk Bugle-Horn Man, Upper Nile"
Morton, Chris. "Portrait of a Shilluk man" Southern Sudan Project (in development). 03 Jan. 2006. Pitt Rivers Museum. <http://southernsudan.prm.ox.ac.uk/details/1998.88.9/>.